Like many other university students, I am currently experiencing the harrowing symptoms that stem from ‘The Dissertation’. Surrounded only by piles of books, notes and the blinding light from my Microsoft Word page I have at times felt as though I may suffocate under the weight of post-it-notes. Thankfully I am doing much of this from home, in Somerset, where my mum brings me pots of Earl Grey tea and my dogs lift my mood with a snuggle. Until D-day arrives with an almighty slap across the face, glamorous cocktail nights in London are on pause. Shopping has also taken a back seat (did those words just come from me?) so when my Grandma invited me to an afternoon of tea, cake and charity shop exploring I jumped at the chance. My Grandma and I visited No.7 cafe in Crewkerne, Somerset where we enjoyed pots of tea and delicious chocolate cake. She also bought me a bag of chocolate mini eggs for my journey back to London the following day – aren’t Grandma’s the best? We then made our way round the charity shops, searching each rail for something special. I have been charity shopping since I finished school and I can honestly say some of my favourite garments have been bought from a charity shop. The variety of trends, eras and items that are available make charity shops an exciting and rewarding alternative to the predictable high street shops. When I discover something special, it’s not just the price that makes me beam from ear to ear, it’s how unique and precious that item is. I’m not just buying a new dress, I’m buying something to cherish. From my favourite vintage velvet jacket to some of the shabby chic furniture sitting pretty in my bedroom, I owe a lot to Charity shops. 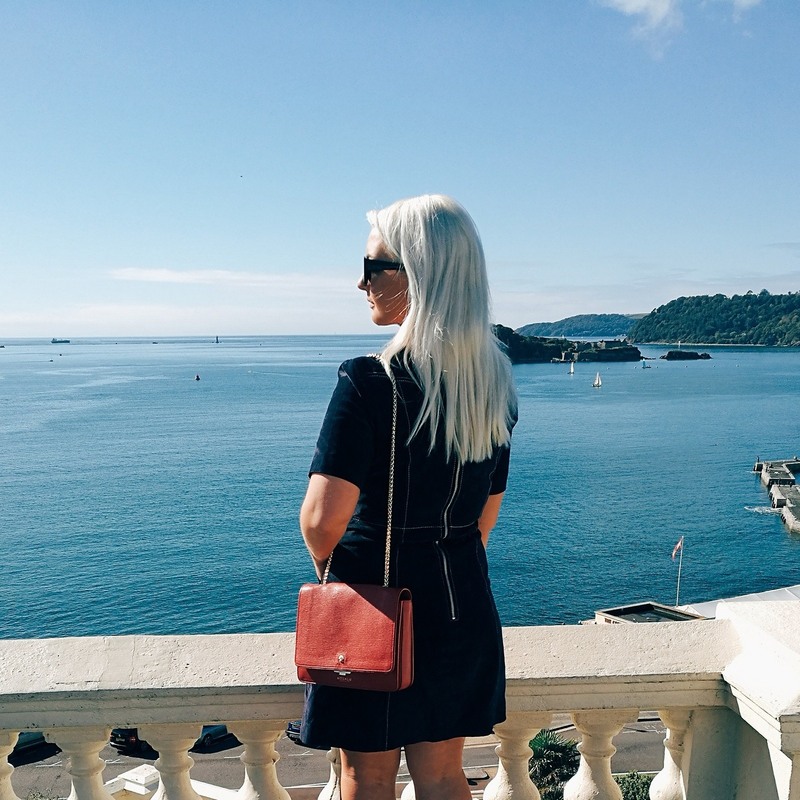 On this particular day I stumbled upon some classic pieces that went perfectly with much of my wardrobe. I purchased these three items from St Margaret’s Charity Shop in Crewkerne for only £9! 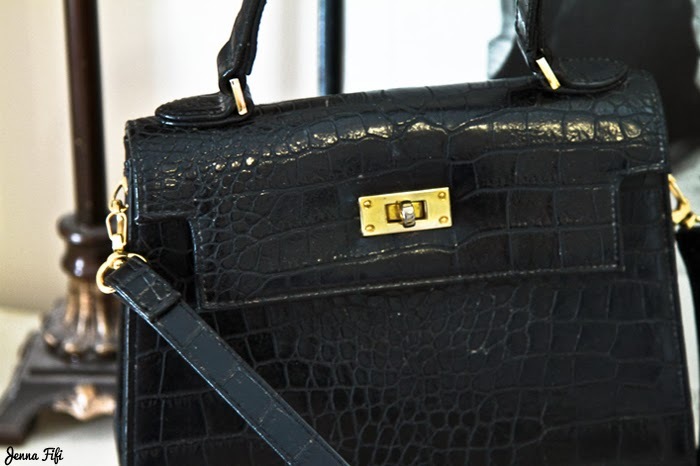 The black crocodile imitation clasp bag (£4.50) is my favourite buy and is very reminiscent of the Hermes Kelly bag. The straps can be removed and the timeless style embodies my favourite aesthetics; elegance and class. The black bowler hat (£2.50) looks fabulous on and really changes the look of an outfit. The wool tartan scarf (£2) was a delight to find! I had caved into the tartan trend a few days before and was coveting a scarf in the iconically British pattern. To stumble across it at £2 was a beautiful moment indeed. I’ve already made good use of this, incorporating the flash of red into my usually monochrome outfits. 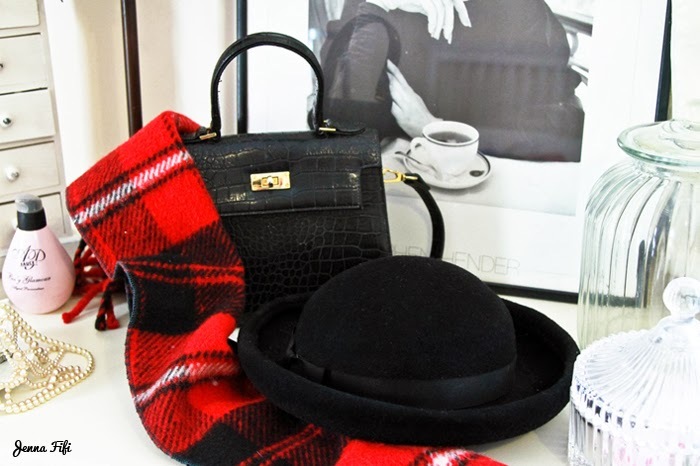 Three lovely accessories for under £10 and all quintessentially British in style – an afternoon well spent! What are some of your favourite charity shop finds? Next Post London Fashion Exhibitions To Look Out For In 2014! Those are beautiful! I love the idea of shopping in charity shops; I think it depends on the area though as the ones near me wouldn't have anything as gorgeous as those inside! Loved this post, and good luck with the dissertation! It may seem like the end will never come but, trust me, it feels so good to be free! Wow!!! Amazing pictures!!! Bag is so chic!! !